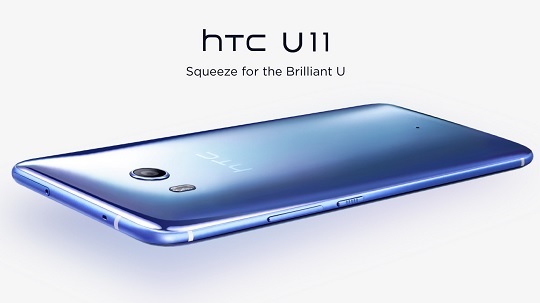 HTC has officially announced the new U11 smartphone in the US, and it comes with high-end specs such as a Quad HD display and Snapdragon 835 octa-core chipset. The U11 is a new member of the U family as well as the successor to the HTC 10. It highlights HTC's latest Edge Sense technology that allows users to do things in a simple squeeze. Edge Sense can be configured to let users access a wide range of functions and applications. One squeeze of the phone can easily open Facebook or other social media channels. With one easy gesture, the U11 can help users with anything they need. It also features Google Assistant and Amazon Alexa, so users can have two powerful voice assistants ready at their commands. The U11 also features water resistance so taking pictures with its 12-megapixel main shooter and 16-megapixel selfie camera can be easily done underwater. The HTC U11 flaunts a 5.5-inch Super LCD 5 QHD display with 3D Corning Gorilla Glass 5 protection. Under the hood is the latest Qualcomm Snapdragon 835 octa-core chipset that is clocked at 2.45GHz, with 4GB/6GB of RAM and 64GB/128GB of internal storage that is expandable up to 256GB via microSD. To keep the phone going, there's a 3000mAh battery with Qualcomm's Quick Charge 3.0 support. Other features include the HTC USonic that combines Active Noise Cancellation and the ability to tune audio to the users' unique hearing. It also comes with upgraded BoomSound Hi-Fi edition speakers. The HTC U11 will be available in amazing silver, sapphire blue, brilliant black, ice white, and solar red colors. Global pricing starts at €749 or about Php42K.